PARSIPPANY, N.J.--(BUSINESS WIRE)--Aug. 12, 2014-- B&G Foods is pleased to announce a tasty transformation of the original melba toast brand, Old London®. The relaunch of Old London Melba features sophisticated and colorful new packaging, contemporary flavors and an easy approach to everyday eating and entertaining. Old London Melba is also unveiling a partnership with Lisa Lillien (a.k.a. Hungry Girl), a go-to resource for guilt-free eating, as well as new product offering, Old London Melba Toasts Ancient Grains. Old London Melba is great for snacking solo or pleasing a crowd in a snap. Old London Melba Toasts are perfect for piling on toppings for an artful appetizer or scrumptious mini-meal. Old London Melba Snacks are perfectly poppable on their own or paired with dips and spreads. Since Old London Melba Toasts and Snacks are twice baked, they can support your most creative ideas. To help spread the word about the relaunch of Old London Melba, the brand has partnered with Lisa Lillien, a New York Times best-selling author and the creator of the Hungry Girl brand. Lillien is the founder of Hungry-Girl.com, a free daily email service that provides diet-friendly recipes, tips and tricks and supermarket finds to over one million hungry people everywhere. Hungry Girl has created delicious recipes, like Buffalo Chicken Toasts, Potato Skin-Style Melba Snacks and Strawberries and Cream Toasts, that showcase the versatility of Old London Melba from snack to meal-time. Old London Melba Toasts and Snacks come in 15 different varieties and flavors and have fewer calories than many cracker brands, making them great snacking selections for everyday eating or entertaining. Old London Melba Toasts have only 60-70 calories and most varieties have zero grams of fat per serving. Old London Melba Snacks have only 110 calories and only two to three grams of fat per serving. Old London Melba Toasts and Snacks have no cholesterol and zero grams of trans fat per serving. The Old London brand evolution will be showcased on social media platforms including Facebook, Twitter (@OldLondonSnacks), Pinterest, Instagram and YouTube, and on its new official Web site (SnackMelba.com) too, with more exciting news to come. Old London Melba is available at retailers nationwide. 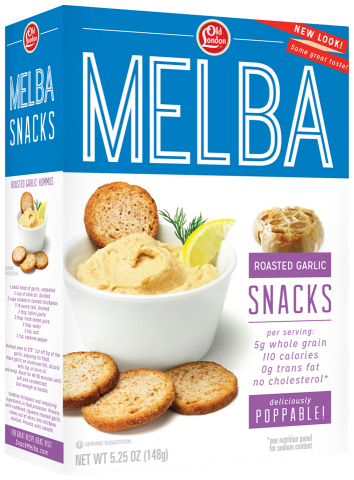 For more information and a store locator, please visit SnackMelba.com. Lisa Lillien (a.k.a Hungry Girl) has turned her appetite for better-for-you food finds, recipes, and swaps into a multimedia phenomenon—from a free daily email service with more than 1.2 million subscribers (Hungry-Girl.com) to a super-successful book series and a hit cooking show that airs on both Food Network and Cooking Channel. Her realistic approach to eating has shown hungry people everywhere that they can eat the foods they crave and still fit into their favorite jeans.